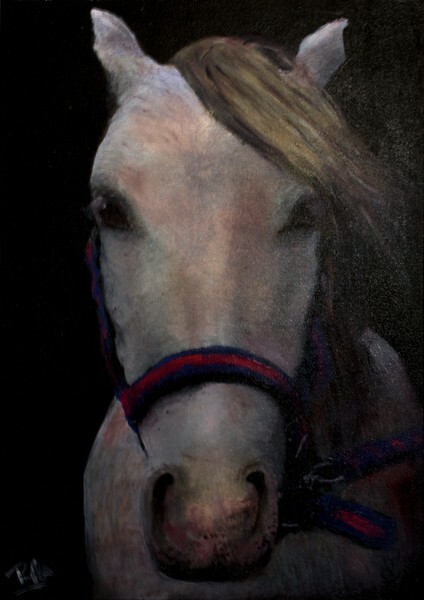 Silver was a commission from last summer and was painted in oils on an 18x24inch stretched canvas. I started with an under- drawing in charcoal and white chalk fixed using a spray fixative. The under-painting was painted using titanium white, burnt umber and a black mixed from ultramarine blue, alizarin crimson and burnt umber thinned with turpentine. The final layers of colour were glazed on using a roughly 50:50 mix of turpentine and linseed oil. The finished painting was then varnished using a spray varnish.